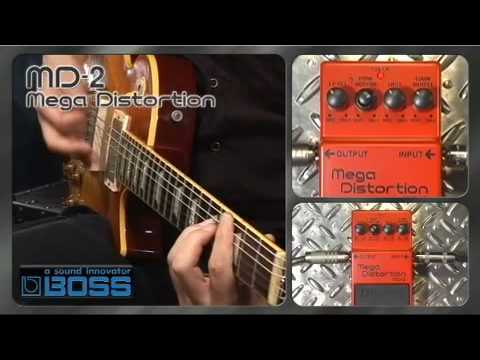 The ultimate in heavy metal filth the Boss MD-2 Mega Distortion Pedal provides real grit. Imagine a potato sack full of old tractor engine parts being dragged through gravel on a concrete floor in the middle of a forge and you’re starting to get close to the bottom-heavy distortion sound that’s made capable by having this bad boy in your set up. The Boss MD-2 Mega Distortion Pedal takes the principles of usual distortion by clipping the inputs signal and adding inharmonic overtones to create the classic warm grit that you would expect. Building on this the Boss MD2 Mega Distortion Pedal offers a dual-stage distortion circuit; adding a Gain Boost control knob to give you extra crushing distortion and incredible sustain, similar to the way distortion was first achieved by over-driving a tube amp. The inclusion of Bottom and Tone controls make it easy to put extra emphasis on the low-end and adjust the balance between high and low frequencies. The sound that the Boss MD-2 is capable of offering makes it the perfect piece of kit for modern metal and hard rock. As with all of Boss’ offerings the Boss MD-2 Mega Distortion Pedal has been built to last. Backed by a 5-year warranty (when you register your pedal with Boss), the housing and controls are robust enough to survive life on the road and will see you adding crunchy, gritty mega distortion to your gigs for years to come.